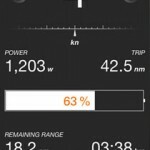 Range till empty calculation is a handy feature of Torqeedo motors — giving you peace of mind by displaying the distance you can travel until the battery is empty. But what if you are in a new waterway and don’t know the local area? Even though this gives you the distance till empty, you may still not know whether that is enough to get you home. It would be cool to have that displayed on a map so you can see the range in a visual way. 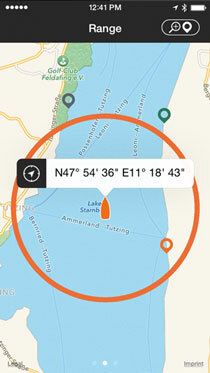 Torc Track app shows this and more right on your iPhone or Android phone. There have been times at night when I would like to easily see the display so the Torq Trac app allows me to see remaining range and the battery situation under low light conditions. 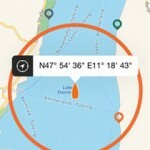 For me this is a handy option now and on my solar boat at night the iPhone becomes my dashboard for motor operations. The Torq Trac can be used on Ultralight, 1003, and Cruise models and requires the Torq Track blue tooth device to daisy chain into the control circuit of your Torqeedo motor. The App itself is available free of charge for download from the iTunes store or Android app store and only works with the Torq Trac blue tooth device. Torq Trac is in stock and available from The Torqeedo Shop on-line store and priced at $199.00 You can also order from any of the dealers listed here and it will be shipped to you in a few days. 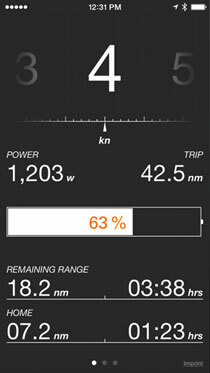 When used with 1003 or Ultralight the range display is automatically calculated by the motor’s computer. When used with Cruise models with Torqeedo Power batteries, the range calculation is also automatically done by the motor and Torq Trac. When using the Cruise motors with non-Torqeedo batteries the range calculation is based on the battery properties that you have setup into the motor’s throttle display. This status needs to be updated manually by setting the charge state back to 100% after charging. The battery capacity is a once-only setting also needs to be established in the controller so that you get a reliable estimate of remaining battery charge at any time during the trip.